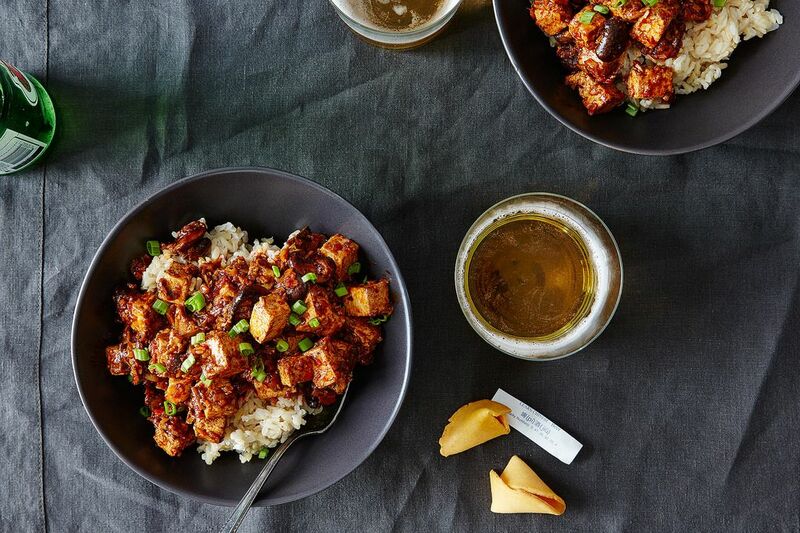 Today: Get over your fear of spicy foods—we promise this ma po tofu will not make steam come out of your ears. I was a late bloomer when it came to spiciness appreciation. As a mild salsa kinda gal with parents who always opted for “nuclear” sauce at our local burrito joint, I let my childhood pass without any foray into the world of the little red (and sometimes green) bottle. I think it was in part because of my cartoon consumption: Whenever a Loony Toon accidentally ate something spicy, its furry little face would blow up like a county fair prize-winning tomato and locomotive-grade steam would shoot out both ears. This seemed very uncomfortable and not at all attractive, so I stuck to ketchup, unaware of my folly. Now a grown woman of the world, I have come around to spicy food and have cultivated a totally respectable hot sauce collection of my own. There is still a line too hot for me to cross (“nuclear” remains entirely outside of my tolerance level), but I crave that perfect balance of flavorful and sinus-clearing, of satisfying but eye-watering. Enter ma po tofu. Out in the world, you will often find this made with ground pork, but a combination of rehydrated and fresh mushrooms can stand in for meat in a pinch, and it also gives the dish a woodsier dimension. Spicy bean paste gives this thing the tell-tale hue of Chinese heat — the kind of dish that gets two little peppers next to its name on the menu —but spooned over a big bowl of rice, it achieves that ideal super-spicy-but-still-enjoyable mix. Best of all, it is killer the next day, after the flavors have melded together in your fridge overnight. Um, no Sichuan peppercorn? Where is the numbing, the ma, in the ma po tofu? This recipe is not true to its name. Vegetarian Mapo Tofu was just featured in the NYTimes Food Section last Wednesday. So this near copy of that column should have been held for a decent interval, so it could look fresh, not derivative.